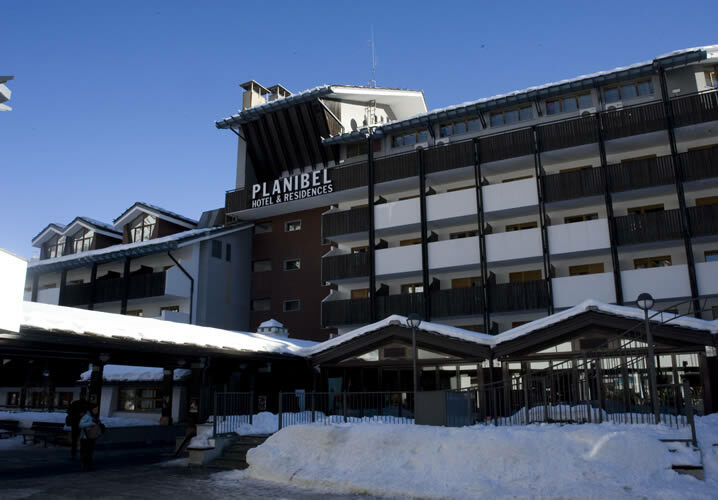 Superbly located close to the gondola, shops, restaurants and bars, the Résidence Planibel offers 4* apartment style accommodation. Prices are based on 4 bed apartments, although a few 2 and 6 bedded apartments may be available on request or at a supplement. Each apartment haS a separate twin bedroom with en-suite shower and WC, a large living/dining room with twin beds (one pulls out) and a second bathroom. The kitchen area has two electric hotplates, sink and fridge. Ski equipment is handily stored in the apartment's foyer. The apartments are spacious and linen and towels are provided. Within the Planibel complex there are plenty of shops, a well-stocked supermarket, a pizzeria, some restaurants and a disco. Please note that the Planibel usually implements a €250 breakage/damage deposit for large groups, payable on arrival. Please also be aware that all prices for the Résidence Planibel are based on full occupancy of an apartment for four people. Other apartment sizes, or under occupancy, will incur a supplementary charge.